Bleach safe towels size 16x28(3.4Lb)at very competitive low price from Towel Super Center. These towels are available in and are excellent for any business or personal use. Heavy weight Bleach Resistant towels for any type of salon or business that use chemical dyes and need towels that can withstand bleach washing. Large size of 16x28 and heavy weight of 3.4Lb/doz. Excellent price offer, if you buy more price goes down further. Full terry loops, no borders running through the towels. As a business owner, managing your expenses is probably one of your biggest priorities. One way you can keep your operating costs as low as possible is by buying towels you won’t have to replace prematurely. Made for use in businesses that use chemical dyes and other harsh substances, our bleach-resistant hand towels are made to last in even the toughest work environments. Our bleach safe towels are available in an assortment of attractive colors, including black, brown, burgundy, navy blue and charcoal. These towels pair perfectly with our bleach-proof salon towels, which come in the same colors. 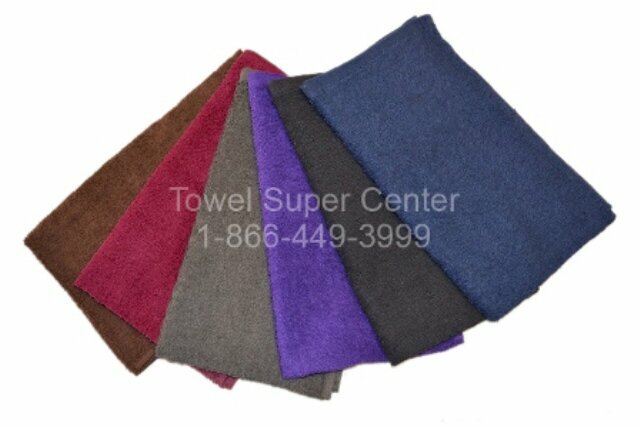 At Towel Super Center, we have a generous selection of high-quality products our clients rely on to last. Our bleach-safe hand towels are made to withstand harsh chemicals and being laundered with bleach. No matter how many times you wash these towels with bleach, they’ll retain their vibrant color and shape. While you may think a bleach-safe towel will become abrasive after too many washes, our bleach-resistant hand towels demonstrate that a bleach-safe towel doesn’t have to become scratchy after frequent use. Our bleach-safe hand towels will stay supple, fluffy and soft to the touch, even after they’ve been used for a prolonged period of time in a high-volume salon environment. While the durability of our products can help you avoid having to replace your towels prematurely, our wholesale prices can also help you keep your operating expenses low. Our tiered pricing structure will help you reduce your costs even further when you buy more products in a single transaction. For even greater savings, shop for products in our clearance section. If you need help deciding which towels are right for your location, contact Towel Super Center to speak to a personalized customer service experience. Our knowledgeable agents will help you find the towels, sheets, washcloths and bath mats in the sizes and colors that are perfect your business. Contact us now!